Hundreds of business customers are temporarily - and in some cases permanently - losing their existing phone number when they migrate to the NBN. Between July and December 2017, the Telecommunications Industry Ombudsman (TIO) received 661 complaints from residential consumers and small businesses about telephone number problems relating to services delivered over the NBN. The complaints mirrored the NBN rollout process (see illustration below). 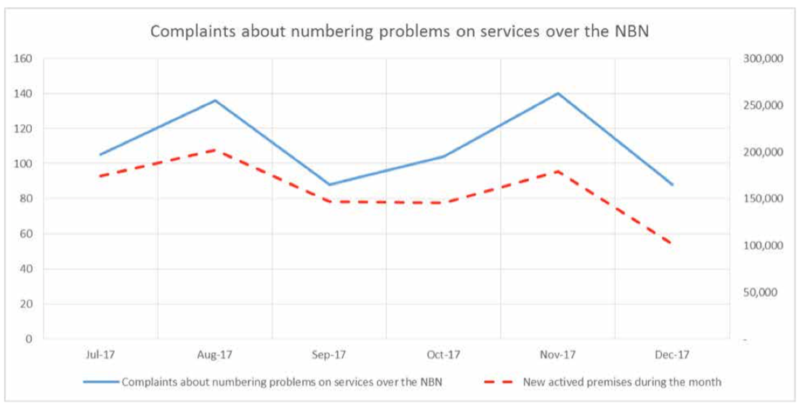 In October 2017, after noticing a pattern of complaints about the issue, the TIO wrote to 23 retail providers of NBN services to better understand the circumstances behind the complaints and what providers believed to be the underlying causes. The results were published in a TIO report (pdf). Businesses expect to retain their existing telephone numbers when moving to the NBN, but some are not aware that they need to take action to ensure they retain their existing telephone number. Business may also be unaware that when a service is disconnected, the existing number cannot be transferred, and that they can lose their right to the number. Transitioning to the nbn is not for the fainthearted. It will involve detailed planning, vigilant project management - and lots of time on the phone to nbn Co. and your chosen service provider. VoicePlus has written a Best Practice Guide to help business migrate. One chapter in the Guide lists the 7 most common ways a business migration to nbn can go pear-shaped. Here is number 3.
b) you can withdraw the order and start again. Withdrawing the order means starting over from the beginning. There are no shortcuts. This can often bring a company close to the disconnection date. Find out the other six pitfalls by downloading the Guide.